Free Shipping Included! 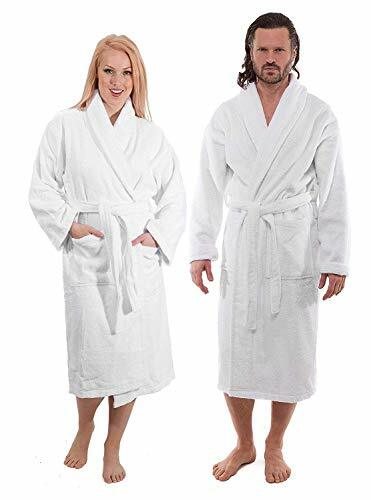 Luxury Terry Cotton Cloth Plush Bathrobe - Premium Cotton Hotel and Spa Robes for Men and Women - Made with 100% Turkish Quality Cotton (XXLarge) by Classic Turkish Towels at My Natures Treasures. MPN: COMIN18JU055832. Hurry! Limited time offer. Offer valid only while supplies last.  LUXURIOUS AND ELEGANT: Featuring an elegant thick shawl collar design, our full terry high quality 100% Turkish cotton bathrobes are also used in 5 star hotels and spas around the world. Bring the feel of luxury to your home!  ABSORBENT AND THICK: Created with looped combed cotton, these robes are rated at 550 GSM, which means they are ultra absorbent and quick drying. Also heavy and thick, but not bulky, to keep you warm especially during the cooler months!  COMFORTABLE AND PLUSH: Wrap yourself up in this plush robe after the shower. Can also be used after a swim in the pool, our ultra plush robes will feel super soft against your skin leaving you feeling relaxed and secured. Our robes also include a belt and two deep front pockets, large enough to keep your hands and smartphones completely safe and covered!  HIGH QUALITY COTTON: Made of 100% Turkish cotton for breathability and strength, made from natural materials and free from harmful chemicals. Turkish cotton naturally provides it's beautiful luster, and plush texture to our robes! Our high quality cotton will protect against shedding after washing and are double stitched to ensure durability. The robes can be machine washed then tossed in the dryer for easy care.  ACCURATE SIZING & MONEY BACK GUARANTEE: Our robes come in several sizes to accommodate both men and women of all forms. Please see product descriptions for accurate sizing. We stand behind our products and services. If for any reason, you are not completely satisfied with your purchase, just return the item(s) in new condition within 30 days after delivery for a prompt refund. If you have any questions about this product by Classic Turkish Towels, contact us by completing and submitting the form below. If you are looking for a specif part number, please include it with your message.